Monday at the Senior Community Center. 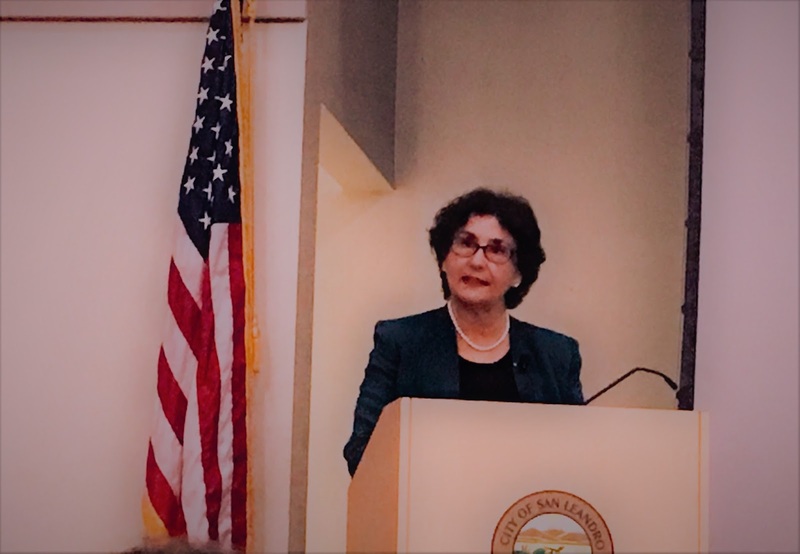 San Leandro Mayor Pauline Russo Cutter, during the annual state of the city address this week, said the city is becoming a regional leader in Smart City technology, spending more money on capital improvement project than any time in its history, and still working on those pot holes. The 45-minute address and video presentation, however, largely left out the current investigation of the city manager and the torpid state of its once-promising cannabis industry. But San Leandro has a lot going for them, said Cutter, who ambled up to the stage using a cane. Cutter recently had knee replacement surgery. “I’m personally working on my own infrastructure,” she joked. Through voter-approved tax increases both at the city and county-level, Cutter says San Leandro will spend $8 million this year on roads, and $13 million the following year. After decades of non-action, a 220-room hotel is coming to the San Leandro Marina, along with 500 new units of housing. The city is also in the early stages of transforming the areas surrounding the Bayfair BART station. A trio of new or remodeled aquatic centers are also on the horizon, she said, and through the Public Art Master Plan approved by the council, a new public mural will be unveiled later this year, along with art work on utility boxes around the city. Over the past year, the San Leandro City Council voted to become a sanctuary city, in addition, to making legislative efforts to combat homelessness in the city. “This year we’ve strengthened the fabric of the San Leandro community itself. I’ve said many times that San Leandro is the city where kindness matters,” said Cutter. For most of this decade San Leandro’s groundbreaking public/private partnership with OsiSoft to provide a high-speed downtown fiber-optics grid has brought the city considerable prestige. Over the past year, Cutter said the city has won awards for its leadership in green technology and its smart lighting project. San Leandro has also been featured at some international forums and conferences for its efforts. Rose Padilla Johnson, a well-known member of the San Leandro community, alleged Zapata made advances toward her over the years in exchange for a city-backed loan for her non-profit. The allegation was preceded by a 23-page letter to the public sent by Zapata that refuted the charges while detailing the city’s dark political underbelly and asserting the allegation was being used as cover by Johnson to aid approval for a then-pending medical cannabis permit associated with her non-profit. Zapata was placed on leave in late January and sources say the investigative report is expected to be received by the city later this month. Posted in Chris Zapata, fiber optics, homeless, infrastructure, investigation, Pauline Cutter, roads, Rose Padilla Johnson, san leandro, San Leandro Marina, sexual misconduct, state of the city, technology. Bookmark the permalink.